One of the greatest challenges of living in our 670 sq ft cottage has been storage. Even though we've minimized our possessions to a large extent, there are still items that need to be stored. 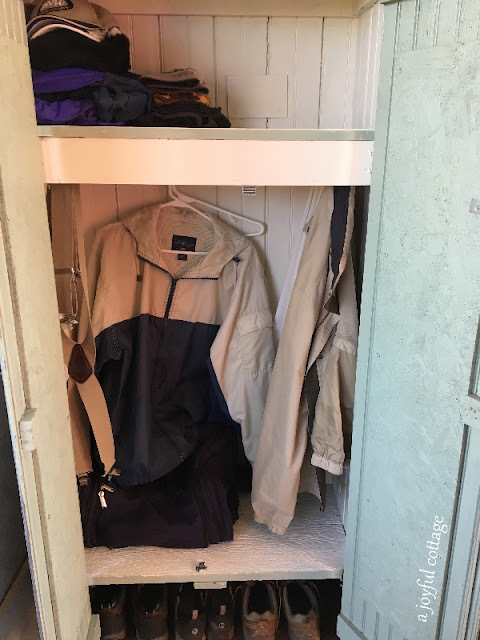 Enter our latest storage solution, this cupboard; the secret I promised to reveal in last Wednesday's post. The cupboard started life in our local coffee shop. I didn't take before photos, so you'll have to imagine it painted black with red fabric panels in the cut-out areas on the left. Dennis covered the cut-outs, made it critter-proof, reconstructed the inside to provide a hanging rod, installed a padlock latch on the right side, and gave it a new paint job. Now the cupboard's left side houses his outerwear and duffel bag. (Notice the direction of the top of his hangers. Am I the only person who would hang clothing here with the hanger's hook facing to the left?) Shoes and boots are stowed under the cupboard, accessed by opening the doors. Dennis uses the right side of the cupboard for artist supplies and painting necessities. 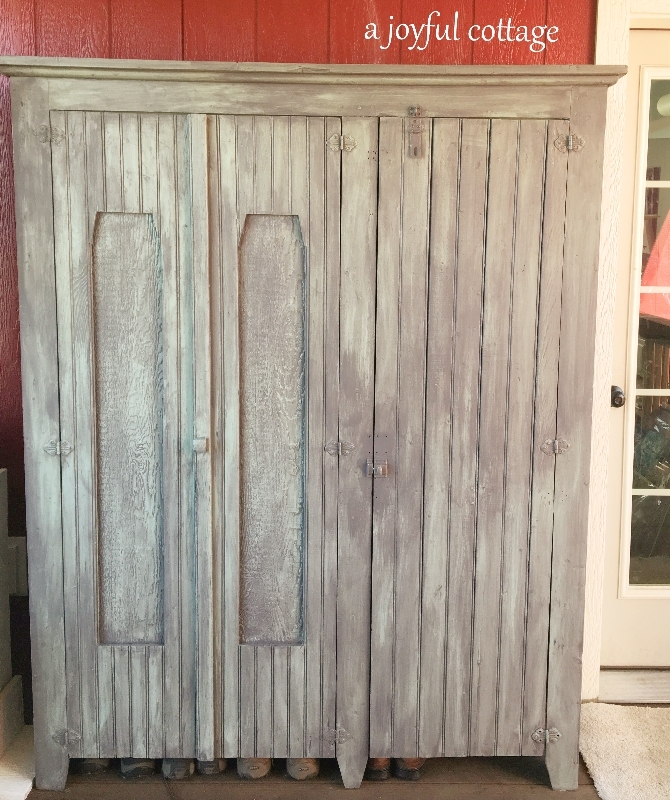 The rustic cupboard sits on the breezeway, right outside Dennis' studio. Very convenient, and believe me the breezeway will look a whole lot better with all his artist paraphernalia tucked away in the cupboard. I actually feel like decorating the rest of the breezeway now that all the junk miscellaneous items have disappeared. Last Saturday our church hosted a ladies luncheon, which meant I needed to make a dessert and a main dish to share. I don't bake much anymore -- as we try to limit our sugar and are pretty much gluten free -- so I don't keep flour and other baked good ingredients in the cottage. 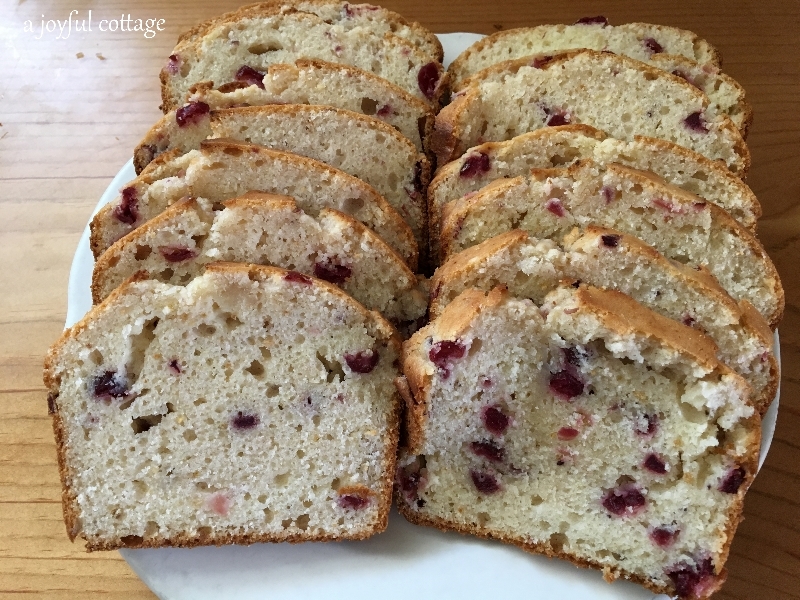 I didn't want to buy those things for just one recipe, so I opted to make a cranberry orange loaf using a Krusteaz mix. Mary at a Breath of Fresh Air blogged about using the mix for her cute Easter muffins. She said the mix -- which has a separate can of cranberries in juice -- baked up moist and not too sweet, and she was right. Very tasty. For the main dish I made a romaine salad with chicken, chopped green onions, pecans and dried cranberries, and tossed it with poppy seed dressing. I found the poppy seed dressing recipe online. It was pretty good, but it uses mayo and sour cream. Next time I'm going to try a non-dairy version. Overall, though, this salad is scrumptious. Dennis had some and loved it. I don't think you can go wrong with chicken, cranberries and pecans. Adding the green onion really works, too. Now for the announcement. Very soon we'll be opening an online store where we'll offer Dennis' art, my handcrafted rugs and mixed media collages, and eventually other items. We've been talking and praying about this for a couple of years, but the timing never seemed right, nor was I comfortable with the mechanics of e-commerce. Recently, though, one of my readers contacted me about buying a watercolor print and after we sold it -- and she loved it -- it got me to thinking that maybe now's the time to sell through the internet. I've had a fair amount of retail experience. I've been a window dresser, sales associate, buyer, and I managed our own gallery and consignment shop in Estes Park, Colorado. In fact, that's where the name of this blog came from. Our shop's name was A Joyful Cottage, and that will remain the name of our new store. My blog won't change or relocate. 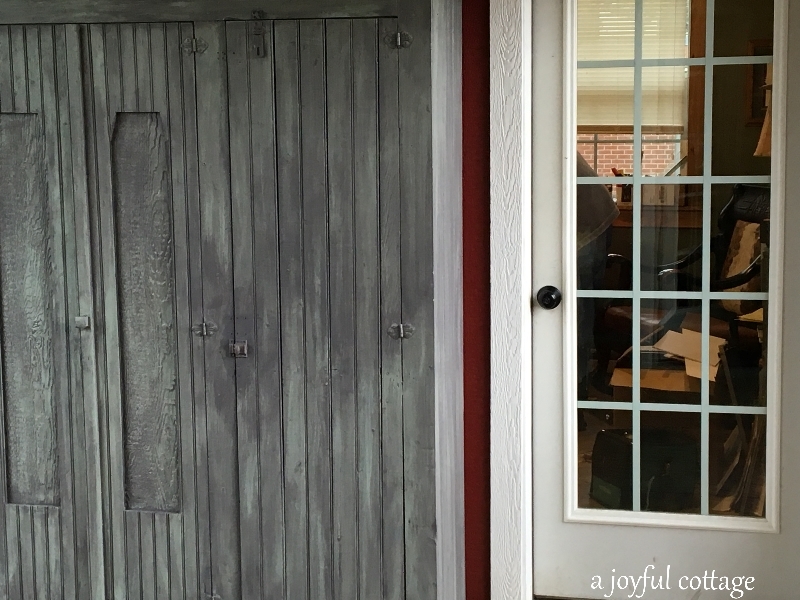 A Joyful Cottage blog will still be about cottage living and I'll continue featuring small homes every Saturday in my Living Large In Small Spaces series. The only difference will be that I'll have a shop tab that will take interested readers directly to our store. And from time to time I may mention shop happenings. So, right now I'm immersed in e-commerce, and what an education that is! Fun, too. I guess I love a good challenge, love change, growing, and trying new things. I'm an adventurer at heart. And a dreamer. Oh, yes. I'm a dreamer. that it took two people to dream them." When we launch the store, you'll be the first to know. 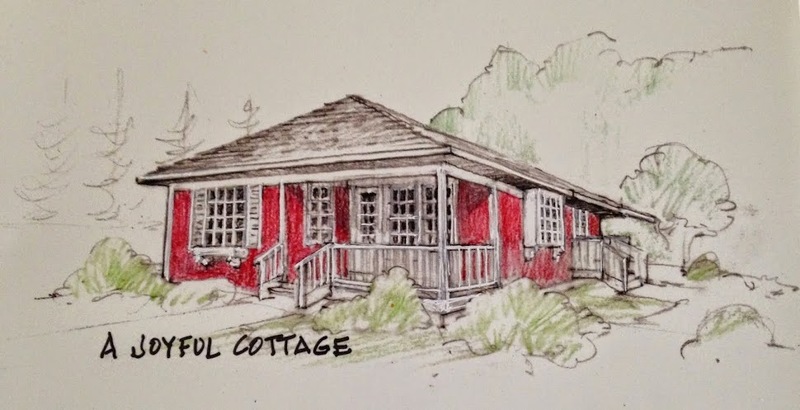 Congratulations on starting your 'A Joyful Cottage' online store, looking forward to visiting when it opens. Your salad and the bread both look amazing. I suddenly would love to have both of those for dinner. Proud of you for taking the leap! I need to buy a lottery ticket........just the other day I was wondering to myself if your husband sold his art online and your rugs too. And BINGO, now I have my answer. I love your blog......keep posting. I live in a small house 920 sq. ft. When you feature little cottages that people live in I love it. I get some great ideas. P.S. great cabinet! Thrilled to hear you will be opening an online store - wishing you all he best. 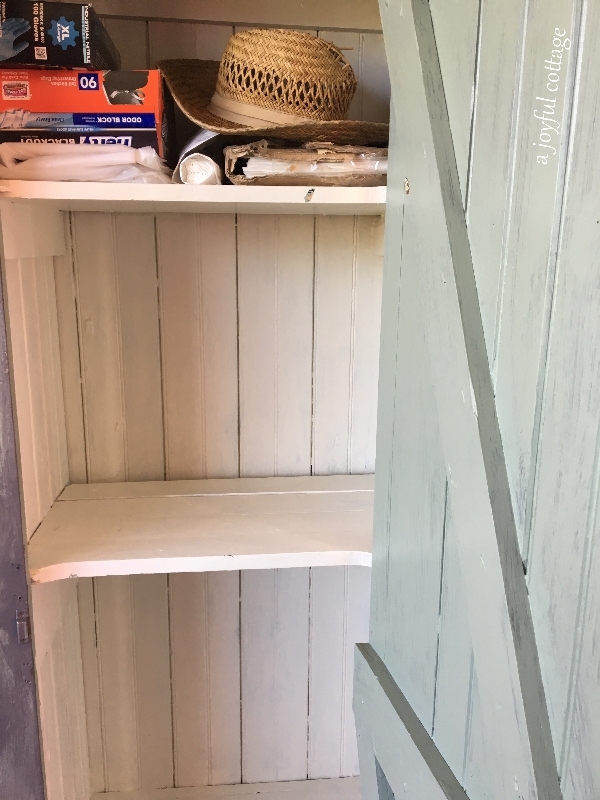 It's a cupboard cabinet to love dear, I think it's great storage and rustic beauty in addition to adding to your petite cottage charm. I would have never guessed your cottage was this small? Your home lives so big. This in reason as to your organizing skills. My home is also a small cottage with large space in areas that allow armoires to store all my art, books, and sewing materials. I love how much you inspire from living grand in a small cottage. Thank you, Dore. You always encourage me. You sure saved the most exciting news for last, Nancy! It sounds as if you have the background for this and will be steps ahead in your new business. And it is our retail future, evidently. Keep us posted! That cupboard is stunning, would be beautiful in a home. Hmm, I hang all my hangers the other way! I'll have to try the bread mix. I remember making their lemon squares ages ago that were delicious. I know it must have been delicious with that salad, exactly my kind of salad! I can't wait for your new store! I am excited to see what goodies you will be offering. LOVE the cupboard! Dennis did a great job updating it. Nancy, this is very exciting news. My daughter and best friend have been after me to try an on line store, but I'm a scaredy-cat, LOL. Your food looked yummy, I love chunky chicken salads. Nice cupboard too, great job! I'm looking forward to seeing your store. Here's wishing you the very best! Congratulations on opening an e-store, Nancy. That is really exciting and I know you will do well. You have good background going in,too. I love that cupboard- it is a great storage unit and really holds a lot! I think those big pieces really add a lot and give a nice 'presence', too. I am excited for you. I love the quote you shared. You are a sweet team. I like the cupboard. Well done. I am looking forward to touring the e store. Please share the dressing recipe - I'm searching for an easy recipe for a girlfriend supper. The cupboard is so sweet. Love it. I cannot wait to see your opening of the shop on line. Congrats how exciting. Oh...that cupboard! Be still my heart. It's so charming! Your dessert and main dish look lovely. I use Krusteav quite a bit when I want a shortcut. Sometimes we have to whip up something fast and I think all of their products are wonderful. 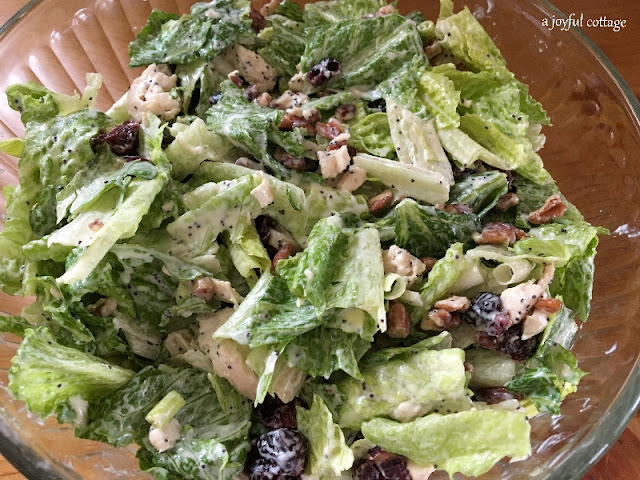 Your salad looks fantastic---I'd like to try something different with a chicken salad like poppyseed dressing. What a great piece of furniture! And congratulations on your new venture, so exciting for you two! Good morning Nancy, and congratulations that you both are taking the step to begin your business! YAHOOO! I am blessed to hear about this because no matter where we are in life, it is worth taking a step toward challenges unknown to us. I wish you both such fun and growth as you venture out. HAVE FUN. And, I love your new storage. It looks wonderful with the cottage! Loved . . . LOVED . . . the cupboard . . .
the design, updates and how it is painted . . . Curious . . . color looks grey/green/white with some dark . . .
Can you share what you used for paint, stain, etc. Salad looks and sounds scrumptious . . .
Might have to make that soon. I have a homemade Poppy Seed dressing, (Mister Irish favorite), I will send you. Excited for you and your new e-shop . . . Sounds promising to me . . .
That cupboard is wonderful and what a great place for storing artsy things for your husband, right outside his studio. That bread and your salad look delicious! It's time for me to eat some breakfast as those pictures really started making me realize I'm hungry. Please send me any info about opening a store on your blog. I am totally interested to do this. It was a dream of mine and my husbands to sell things we made, online. I did sell some on Etsy, but it just isn't the same as it was when it was strictly for handmade items. I've been discouraged, so the shop is sitting empty at the moment. I wish you and your husband well with your e-shop. I think you will do very well. Nancy, I think that this is wonderful news. The art that the two of you create is just too good for you to keep to yourselves and local folks. Going global!! I am so impressed. Good luck my friend!! Hugs and hugs!! Look at all these wonderful comments! Looks like you hit on something great! By the way, I DON'T know of anyone who hangs their hangers from the left. Are you left handed? Perfect cabinet for your breeze way! That salad looks Divine! I can't wait to visit your online store ~ all best luck! 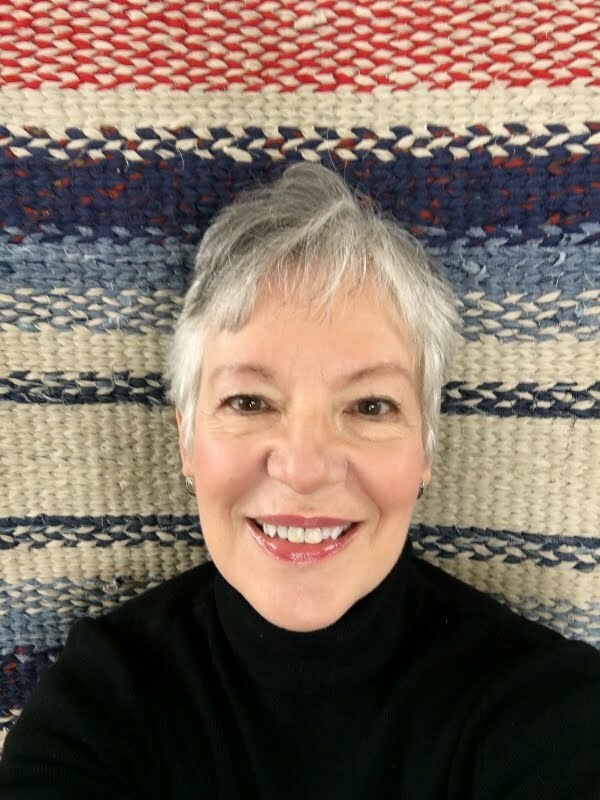 Nancy, I'm so happy Kim led me to your blog. And now, a store too. Can't wait to see all the items. It'll be a big success, I just know it. Oh, my, the food looks yummy!!! A big CONGRATULATIONS to you on your new business venture!!! I can't wait to look around in your online store!! So happy for you and your husband, and trust God will bless your every effort! Hi Nancy, I totally get the storage problem. My cottage is 800 sq. ft. and only me. So, with the two of you it would be difficult I love what you came up with it's perfect. Nancy an on line business sounds exciting, looking forward to visiting it. Love the rustic cabinet and like you I think Dennis hangs his hangers in the opposite direction than most. Makes him unique, wink wink. Your salad is my kind of meal, Yum. That old cupboard is fabulous!! What a wonderful piece to us for storage! And congratulations on your new online store, Nancy! Exciting times, Nancy! Best of luck with the new shop. I love what you and Denis did with that cupboard. Fun news! Good luck with your exciting new endeavors! What a joy-filled post, Nancy! That cabinet is wonderful! And that food looks so tasty (I'll have to look for the Krusteaz mix. Nice to have something quick like that on hand). Congratulations on your new venture. Sounds just perfect!! Wishing you and Dennis all the best with it! That cabinet is a wonderful piece. I really like the paint job on it. Yes, people who live in tiny or small spaces who are not minimalists are always looking for nooks and crannies and ways to store stuff. Every inch counts in a very small home. Outside storage areas are a great idea. Looking forward to what happens next in that breezeway. Blessings as you start selling your art and crafts. I've not had reliable internet for the last ten days or so. We're in an RV park in Phoenix for a few days and I couldn't wait to see what you had to share. I LOVE your 'new' cabinet. It's perfect. I wish I had taken pictures of our dear friends' covered patio area/breezeway. It was such a fun place to be. I'm looking forward to your new business. The "new" cupboard has the perfect look for your cottage. Good luck on your new adventure! First of all, I simply LOVE the new cupboard! It is so rustic, and perfect for accommodating all of the storage needs in a lovely way! And your cranberry bread and salad look very delicious! I've never made cranberry bread, but it certainly does sound easy to make, and moist too. So excited for you Nancy! I know that the Lord has His hand of design on this for you both, and while it is a big step of faith and a learning curve too, you are up for it all, you have great experience in the past, plus the Lord will be with you too. Praying for you and your new adventures! :) Hugs!